KPA has developed a range of resources to support agencies understand and embed GDCP. 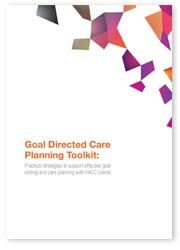 This Goal Directed Care Planning Toolkit was developed as part of the Eastern Metropolitan Region (EMR) Home and Community Care (HACC) Goal Directed Care Planning project. 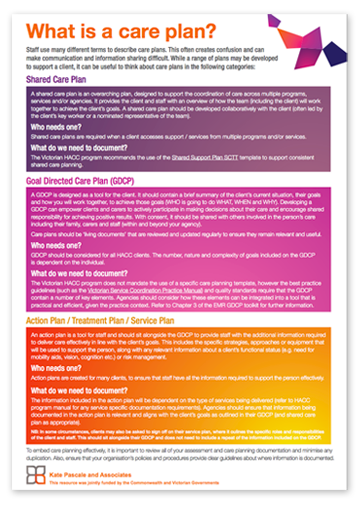 Staff use many different terms to describe care plans. This often creates confusion and can make communication and information sharing difficult. This resource describes different types of care plans and provides examples about how they are used in practice. We know that staff are committed to working in person centred ways and constantly tailor their approach to match each client’s priorities, strengths and abilities. Often though, staff report that translating this approach into writing and documenting meaningful GDCPs is challenging. 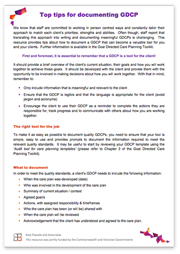 This resource provides tips about how to document a GDCP that can become a valuable tool for you and your clients. This FAQ sheet provides answers to some of the most common questions we are asked about GDCP. We are therefore confident that the audit tools are relevant to, and consistent with the care planning guidelines across a number of sectors. 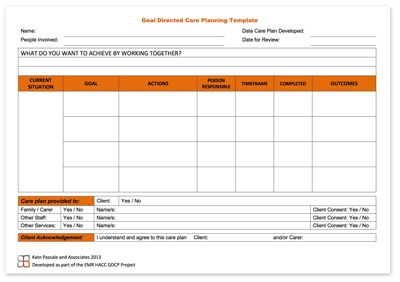 Organisations need to ensure that their care planning template is simple, easy to use and provides prompts to document the information required to meet the relevant quality standards. 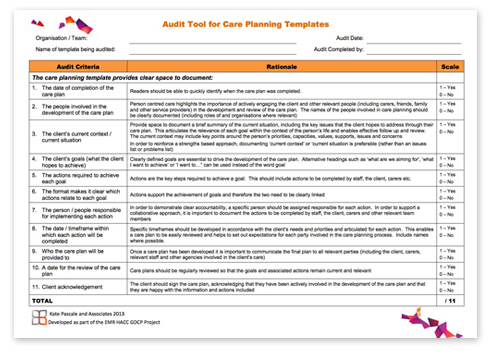 The Audit tool for Care Planning Templates (PDF) provides a quick and easy way to review your existing templates and identify areas for improvement. 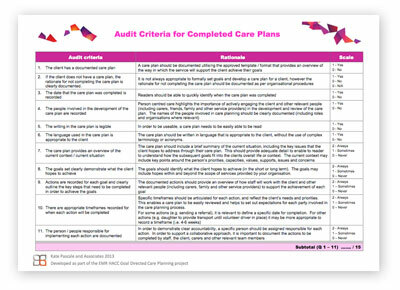 The Audit Criteria for Completed Care Plans describe the key information that should be documented during the development and review of care plans. This enables staff to objectively assess and measure the quality of documentation. Assessing care plans against the criteria can be valuable to build the knowledge and awareness of staff and to support ongoing quality improvement. 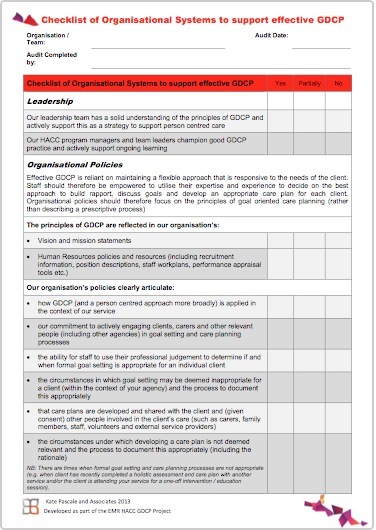 The Checklist of Organisational Systems to support GDCP (PDF and word) has been developed to support agencies review their progress in relation to developing organisational systems that support effective GDCP. 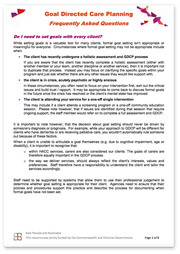 Effective GDCP is reliant on staff’s skill and confidence in having a conversation with the client (and their carer/s), understanding their needs, priorities and identifying how best to support them to achieve their goals. This requires us to move away from a ‘tick the box’ style assessment and adopt a more conversational, in depth approach. The Learning Community for Person Centred Practices and Helen Sanderson Associates have developed a range of tools and approaches that provide staff with practical, easy to understand strategies to support GDCP. Basic Microsoft Word templates, for a number of these tools, are provided with permission from The Learning Community for Person Centred Practices and Helen Sanderson Associates.